The initiative comes from the Schola Sanctae Scholasticae and they have used material with permission and encouragement from other devotees of chant - you know, places like St Cecilia's, Ryde, Pluscarden, Solesmes... as well as other online promoters of chant such as CMAA and the Society of St Bede. The Schola Sanctae Scholasticae (Dr Candy Bartoldus, Clare Bowskill, Julia Jones, and Martina Jelinkova) have sung at Blackfen and Brighton and if I am undeservedly blessed again, they just might find their way to visiting another seaside town before too long. Bara Brith has posted on initial responses to the new website, but also includes a useful list of her other favourite resources. 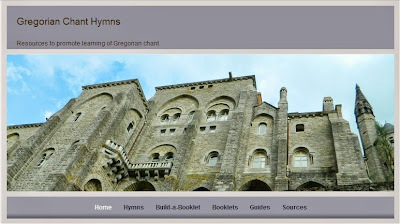 Gregorian Chant Hymns is the fruit of much labour and is a welcome contributor to the grass roots revival of Catholic music and devotion.